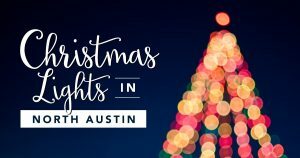 The most wonderful time of the year is here and that means glittering lights across the greater Austin area! We’ve compiled a list of the can’t-miss lighting displays around our area. From Thanksgiving until New Year’s Eve, this cul-de-sac offers a bright arrays of lights and holiday music. They also collect toy and cash donations for SafePlace, a local shelter for women and families. Lights are on Sunday – Thursday 5-10pm and Friday – Saturday 5-11pm. Bring your donations and enjoy the lights! Featured on ABC’s Great Christmas Light Fight, you can’t miss the stunning display this family puts on every year through New Year’s Day. On December 22, 2017 Santa stops by for pictures. They are also a donation spot for Cedar Park Area Food Bank. With a little bit of everything, this cul-de-sac will brighten your spirits with their brilliant light show. Bring new toys as the residents will also be collecting unwrapped toys for Williamson County Brown Santa. This home features handmade animatronics, snow machines and over 33,000 lights including “Elfvis,” Olaf, the Grinch, and more. Come celebrate the holidays and don’t forget to bring unwrapped toys for Blue Santa. From December 14 – 23 at the Old Settlers Association in Round Rock, enjoy this festival and carnival celebrating all things Christmas. The nightly event will even include a live radio performance of A Miracle on 34th Street. 25,000 lights brighten this home! The show runs Sundays – Thursdays 5:45 – 10pm and Fridays and Saturdays 5:45-11pm. Come enjoy cookies, cocoa, asing-along, story time, and photos benefitting Make-A-Wish Central and South Texas. This family has been elaborately decorating their home for 24 years! Santa visits December 9, 15, and 20 from 6-10:30pm! With more than 40 displays, 2 million lights and holiday activities, this is the can’t miss show in the Austin area. The lights are lit from December 9 – 23. Don’t miss out!